Darien's Phil Huffard (42) defends the goal during the East meets West lacrosse invitational against Torrey Pines California at Darien High School on Saturday, Apr. 14, 2012. It's never too early to start preparing for next season, and that's especially true for lacrosse players in Fairfield County. Due to the sport's enormous popularity and fierce competition in the area, many student-athletes are looking to hone their lacrosse skills year-round in order to gain an edge. That's where the CT Chargers come in for interested players in grades 5-12. 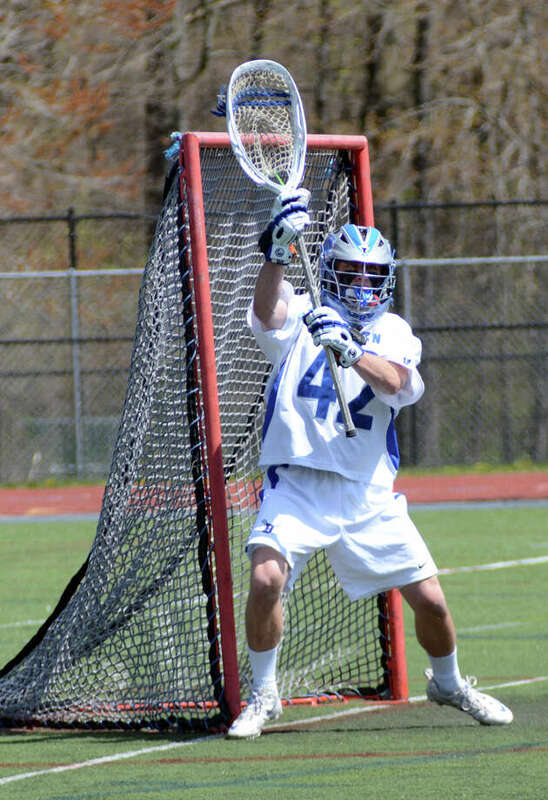 Run by Darien High School lacrosse coaches Jeff Brameier and Lisa Lindley, the Chargers recently completed their seventh season. "With each summer that the girls play, they obviously get better as players because they're playing more months out of the year," Lindley said. "Their skills are getting to higher level." The camp features an all-star lineup of past and present high school coaches, including Darien High alumni and all-time NLL record holder in faceoff wins Jamie Hanford, New Canaan High School boys head coach and Princeton National Champion Chip Buzzeo, Darien High School boys assistant coach Dan Arestia, New Canaan alumni and former assistant coach Bobby Lutz, Darien alumni and former All-American player Stephanie Calabrese, Darien alumni and former All-American player Courtney DePeter, New Canaan alumni Amanda Mastera, Darien alumni and All-State player Kim Pepe and more. "(Having kids from different areas) is nice and the most positive thing is everyone knows that our product is a great product," Lindley said. "There's quality coaching, they're getting the looks that they need and they're getting exposure to college coaches which is the bottom line." But coaches aren't the only diverse aspect of the Chargers, as Darien, New Canaan, Wilton, Greenwich, Norwalk, Rye and more are all represented. "I think it's great that players from different towns can come together and compete together. You learn so much from playing with other players. That is a fact," Buzzeo said. "When a New Canaan player plays with a Darien, Greenwich or Wilton player, you pick up on things that maybe you haven't seen all spring playing with the same guys you've been playing with for a long time. You learn certain skills with the game in playing with a variety of different players." This summer was Buzzeo's second with the Chargers. "Having elite athletes come together and compete is fun and you learn things," Buzzeo said. "It was special coaching different players." Beginning with the high school class of 2008, dozens of local lacrosse players are either playing lacrosse in college or have committed to do so after graduating high school. Several CT Chargers have already committed to playing their sport in college even though they won't graduate from high school until 2015. Travel is a big part of the Chargers' summer program, as they compete in elite tournaments in Maryland, New Jersey and Virginia. When the Chargers practice at home, they typically use the SoNo Field House, Darien High School and Greenwich High School. "It's grinding. It's six weeks of really a lot of time and a lot of commitment," Lindley said. "Kids are from all over Fairfield County, but for me the benefit is obvious: When they're playing with the Chargers, they come in at a higher level at high school."